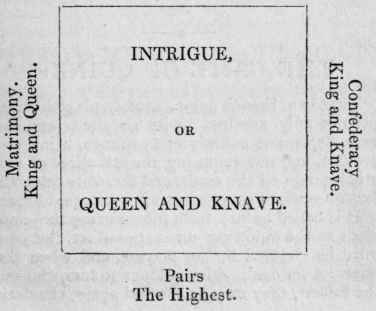 the three prizes to be gained by those who happen to have purchased corresponding cards, and such as happen not to be drawn are continued till the next deal. This game may be played with a single pack, by separating the same into two divisions, each containing a red and black suit. Best The ace of Diamonds turned up.